In ancient Egypt, the Eye was a predominant magical symbol and a religious image seen in temples and tombs. 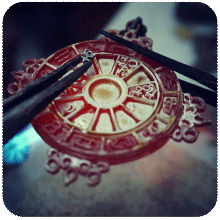 It was also worn by many as lucky charm or amulet. The most common image of the Egyptian Eye is that of a human eye shaped like a falcon, after a mythical falcon-headed Egyptian god of the ancient times. The image of the eye has markings around it that resemble a falcon. 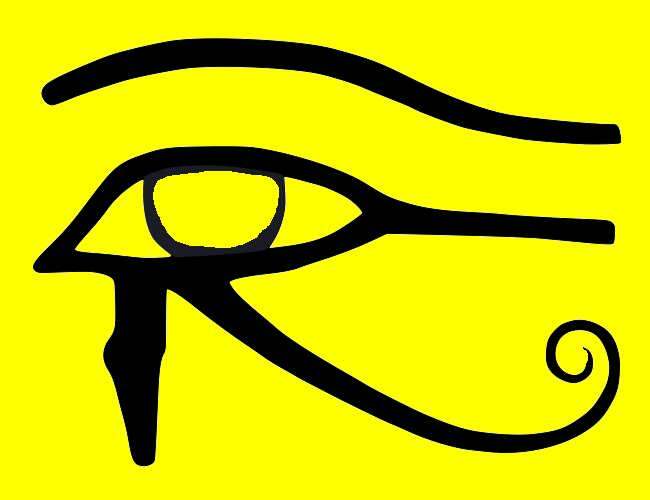 This eye image was so popularly used that it became symbolic of ancient Egypt. 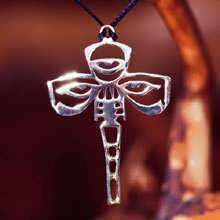 It was particularly associated with religion and belief in symbolic amulet or talisman. Surprisingly, Egyptian religious manuscripts reportedly do not mention the Eye that much. Moreover, there seems to be much confusion about the origin and the real symbolism of what is now called the Eye of Horus. It was sometimes called Eye of Ra, sometimes, Wedjat Eye and other times, Eye of Osiris. 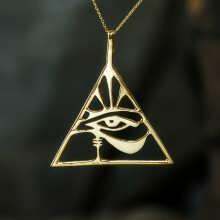 Further, the Eye is also associated with other deities, mostly children of the sun god Ra. Horus and Ra were described both as important gods of the ancient formal religion of Egypt. Both Gods had strong solar links, and both were close to the Pharoah. Ra, however, was a creator god. He was the first king of Egypt and also described as ruler of the universe. Horus, on the other hand, is said to be of two forms: the ancient Horus, the falcon-headed and co-equal with Ra and the younger Horus who was a great-grandson of Ra, born to Ra's grandson Osiris. The first Eye was associated with Ra. It was a dynamic, force-wielding eye that Ra could detach and send whenever there were some urgent things to do. Horus's story has more versions. He was described as a cosmic falcon with the sun and the moon for his eyes. 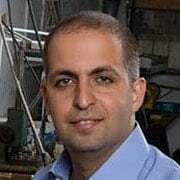 Later, he was the son of Osiris and Isis who became one of the early rulers of Egypt, replacing his father after the older man's death and Horus victory over his uncle Seth who tried to take the throne from him. Of the two forms of Horus, the older cosmic falcon who was almost co-equal with Ra and the young Horus, Ra's descendant deity, the later Egyptian kings purportedly associated themselves with the younger Horus more. The younger Horus became associated with the Eye only after his royal fight with his paternal uncle Seth (also described as his brother in some stories) who murdered his father King Osiris to grab the throne. In the dispute, Seth stole the moon eye of Horus while the latter was sleeping. The eye was either buried, swallowed by Seth, thrown into the ocean or smashed into pieces by Seth. But with the succeeding story that Hathor, the ancient Egyptian goddess of joy, feminine love, and motherhood, restored it, the Eye was most likely just broken into pieces. After the eye healed, it was called Wedjat eye or the uninjured eye. Its power helped Horus to enthrone his father to eternal life. Henceforth, the Eye of Horus has been regarded as symbolic of healing, sacrifice, and protection. The succeeding long lines of Egyptian generations apparently, continue to believe in the magical power of the Eye of Horus to heal, to protect and to unite the Cosmic world. Relics found in ancient tombs and temples include images of the Eye of Horus in painted, engraved or shaped forms. Through generations of Egyptian life, the Eye of Horus began to be used in everyday life. The medical and pharmaceutical symbol "Rx" originated from the Eye of Horus and the healing power attributed to it. 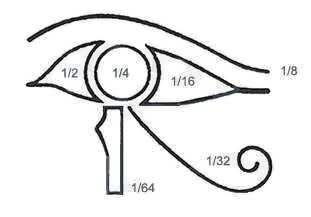 Moreover, the Eye of Horus fraction system that results from combining numerical values of the sections of the Eye of Horus, was used to record prescriptions, grain, and land. These values are the whole number 1 and the fractions 1/2, 1/4, 1/8, 1/16, 1/32 and 1/64. Another explanation for these fractions states that each fraction corresponds to each of the six senses with which we experience our subjective reality. To the usual 5 senses, a sixth sense is added, the sense of kinesthetic or proprioceptor. Even if we combine all the experiences of our senses, we cannot comprehend the totality of reality, just as the six fractions added together only total to 63/64, not 1, the symbol of that perfect totality. The ancient Egyptian belief claims that a being or soul reaches perfect perception of reality only in the next world. This belief is symbolized in the numerical values of the sections of the Eye of Horus. 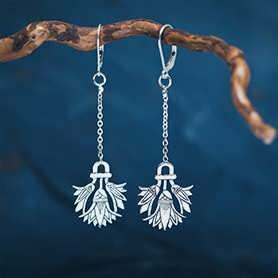 A legacy of the ancient past, the Eye of Horus may be seen in different forms in current times: amulets or lucky charms, home ornaments, gift holders, and sea vessels, to name a few, all manifestations of the belief in the mystical power of the Eye of Horus as religious healer, unifier, self-stabilizer, and protector. 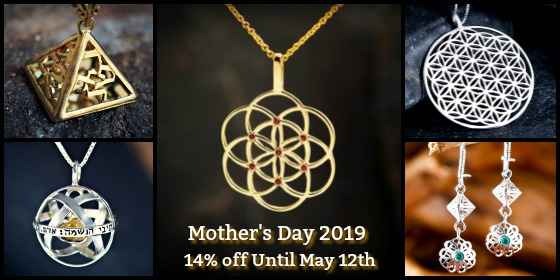 The Eye of Horus has inspired the designing of Several unique jewelry designs - Eye of Horus ring, the Eye of Horus pendant and the Horeb Unification pendant. 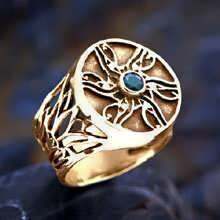 This unique ring design showcases six Eye of Horus designs on the top side, joined together at the center by a garnet gemstone. 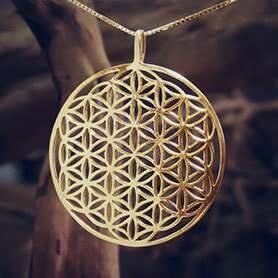 The Egyptian Lotus flower is crafted on the two sides. Lotus aptly symbolizes the sun, creation, and rebirth. At the onset of the evening, the lotus flower closes and goes underwater. At dawn, it opens and rises again, very much symbolism of rebirth and hopefulness. 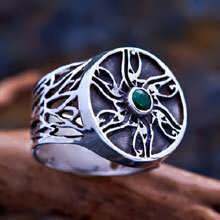 The ring was designed to bring the wearer a sense of protection and unity with the cosmic world where life pulsates endlessly. 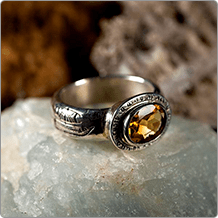 Like the Eye of Horus ring, this healing pendant is available in silver or gold. 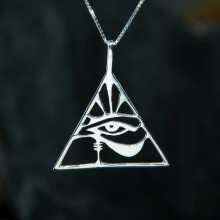 The eye is at the center of a triangle which symbolizes the cosmic unity that connects all creation beyond the capability of human senses. 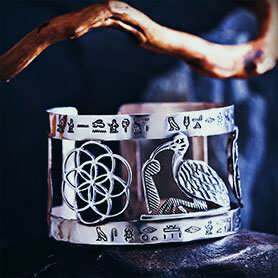 This Egyptian Eye of Horus jewelry intends to awaken in the wearer the desire to find God and the cosmic unity of which he/she is a part. 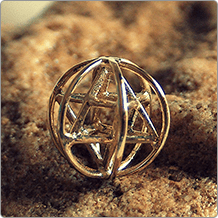 The Horeb Unification pendant was designed by Milton Thompson, for David Weitzman's jewelry design contest. 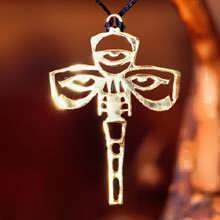 The term Horeb carries with it the name Horus (Hor), after the inspiring image of the Eye of Horus. 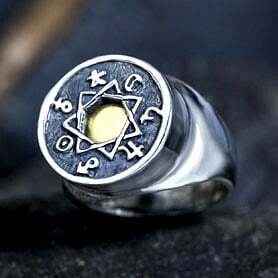 According to Milton, the design represents his Egyptian trinity: the left eye representing the mind; the right eye, the body; and the ankh, the spirit. The ankh is an Egyptian hieroglyph that looks like the Christian cross with a loop above the two stretched out bars. The ankh represents air and water, the two main life-giving elements of nature. Milton sees his creation as a useful tool for maintaining self-balance.